Bobby Marks, a front office insider for ESPN who used to be an assistant GM with the Nets, breaks it down. I had a chance to chat Friday afternoon with Bobby Marks, a front office insider for ESPN who used to be an assistant GM with the NBA’s Nets. Marks generated great interest in the Twin Cities on Thursday when he tweeted about Karl-Anthony Towns and the possibility that he can earn $188 million on a five-year extension after being named third-team All-NBA. *At the baseline, Towns is eligible for a five-year, $156.5 million extension this summer (a figure that represents 25 percent of the salary cap). Being named All-NBA heading into his extension does not guarantee his extension will escalate to $188 million as it would if he was, say, heading into his second contract. That’s just the maximum number he could get. But Marks said it does provide a certain amount of leverage to Towns and his agent, Leon Rose, heading into negotiations. Rose also represents Joel Embiid, and when he negotiated Embiid’s max extension last summer it included incentives that if he reached certain honors he could earn an additional $30 million. It wouldn’t be surprising, Marks said, if Rose seeks a similar deal for Towns. *If Towns is traded this summer — which most people, including Marks, still consider unlikely — he would still be eligible for the same type of contract extension with a new team. The only way he would potentially lose money is by playing out his contract and reaching restricted free agency because the Wolves can offer more in an extension than other teams can pony up in an offer sheet. Given all that, it sure seems likely Towns will sign an extension this summer. *Jimmy Butler, who was also named third team all-NBA, would have been eligible for a five-year, $219 million supermax extension in Chicago had he achieved the same thing with the Bulls. But because he was traded, he is not. Instead, Marks said, the best way for Butler to maximize his earnings would be to play out his contract with the Wolves (one more year before he can opt out) and then sign a five-year, $187 million deal with Minnesota. According to Marks, Butler doesn’t figure to be in a hurry to sign an extension with the Wolves this summer because they can only — and I realize all of this is absurd money — offer him roughly four years and $100 million this summer because of contract rules surrounding veterans who are traded. Next summer they will be able to offer Butler more money and years than another team. The most a team other than the Wolves could offer is four years, $139 million if Butler reaches free agency next summer while the Wolves can give him $48 million more and an extra year. Then again, Butler could decide to take an extension this summer as both a team-friendly gesture and to guarantee his future earnings. If he doesn’t sign an extension this summer and gets hurt next season, he could potentially be leaving a lot of guaranteed money on the table. 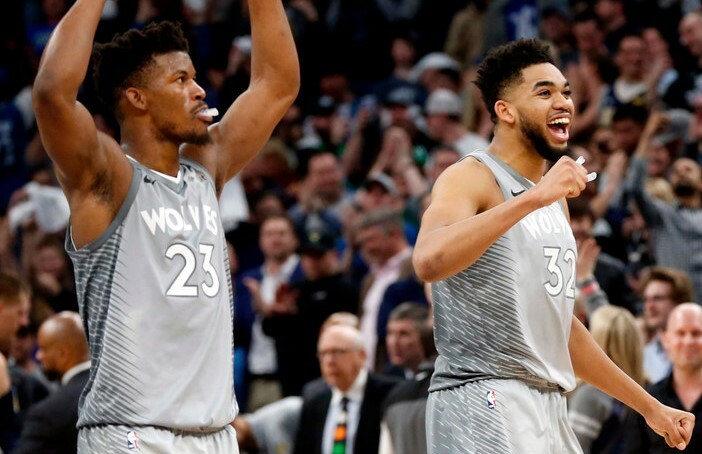 *Can the Wolves afford Towns, Butler and Andrew Wiggins, who already signed a max extension last summer that is set to kick in? Marks said yes, but it gets tricky. The Wolves would probably be paying the luxury tax, and that figure could climb depending on how much Towns and Butler get. It also puts pressure on finding effective lower-cost players to fill out the roster. “Guys like Tyus Jones, Justin Patton and the pick they have in the draft this year, they’d really have to nail those,” Marks said.